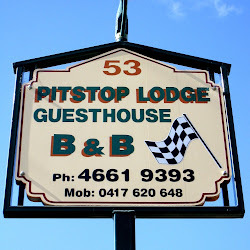 Pitstop Lodge Guesthouse and B&B is situated in Warwick, Queensland, a comfortable 2 hours drive from Brisbane or 2.5 hours from The Gold Coast. Pitstop is truly a ‘Home away from Home’. No matter what brings you to Warwick, business, festivals, sports events, our famous rodeo or Morgan Park raceway, you’ll experience country charm and hospitality with that personal touch from your friendly hosts Yve and Chris. The B&B is a fully renovated Queenslander style country home that is instantly welcoming and relaxing. Being self-contained, everything you need for an enjoyable stay is readily at hand. Enjoy beautifully appointed bedrooms with reverse-cycle air-conditioner, modern kitchen and showers that run hot and strong. There are living areas for all seasons, from the large back verandah with its bbq and outdoors setting for the barmy weather, to leather sofas and a fireplace indoors, should you get a bit of a nip in the air during your stay. Pitstop Lodge really is quality no-fuss accommodation that’s affordable, comfortable and so convenient, as it’s just a leisurely stroll to our historic Warwick CBD with its cafes, restaurants, coffee shops and modern shopping mall. Dorm Room	From: $60	This room is available for those on a budget, or children as part of a family group. Reverse cycle air conditioning. Continental breakfast is included.